In an original Alfred Syles fruit wood wedge section frame with gesso window mount, overall size 65 x 150 cm. This design was commissioned by Austen Hall, an architect and friend of Clarke's, for the Bankers Clearing House, which occupied the eastern part of Coutts and Co. 15 Lombard Street, (completed in 1955 by the architectural practice of Whinney, Smith & Austen Hall). Once Clark's design had been submitted and approved the finished Murals, which measured well over 6 ft in height, were worked upto in Clark's St. Peters Square studio. 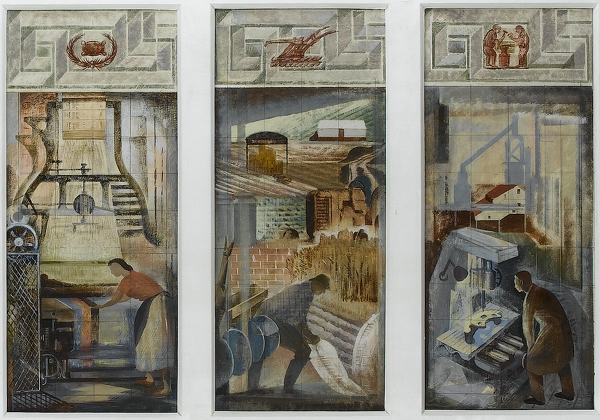 The panels depict Transport, Commerce, Industry, Agriculture, and Science. The two panels to either side, and along the top, show mofits taken from token coins - money made (sometime officially, sometimes unofficially) as an alternative to small change, for example for used by pubs or fairgrounds. 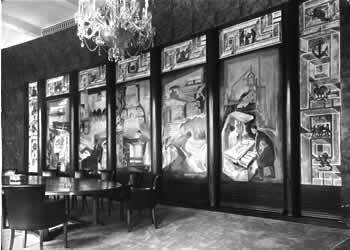 When the Clearing House relocated in 1992 the original panels were removed and acquired by the Museum of London.